All across the country, homeowners are trading in their open layouts and backyards for the portable, adorable convenience of a tiny home. These exceptionally small houses vary in size from 100 to 400 square feet, allowing Americans everywhere to downsize their lives and set out on the road without the added costs of hotels. With the popularity of the green and wanderlust movements, it’s no wonder tiny homes are the home of choice for young people and empty nesters alike. However, when Mother Nature takes a turn for the worse, how do tiny homeowners protect themselves from heavy rains, high winds, and dangerous debris? If you encounter hurricanes or tornadoes during your travels in your tiny house, its shape could have a major effect onits stability in high winds. The right wind gust can rip away your roof and tip a tiny house over, so distributing the weight of the home evenly across a wider base may help prevent a capsized house. Opt for a tiny home with a low roofline and a shape with multiple planes of wall connection, such as a square, hexagon or octagon. Roofs are liable to be torn off during heavy storms. With the right shape and construction, however, your tiny home’s roof can remain firmly in place. When choosing a roof for your tiny house, look for a roof with multiple slopes. Hip roofs are particularly helpful because they provide a more aerodynamic design that allows high winds to slip right over the home. If your tiny house has an overhang, be sure it’s limited to 20 inches at most to prevent wind from catching it and causing damage. 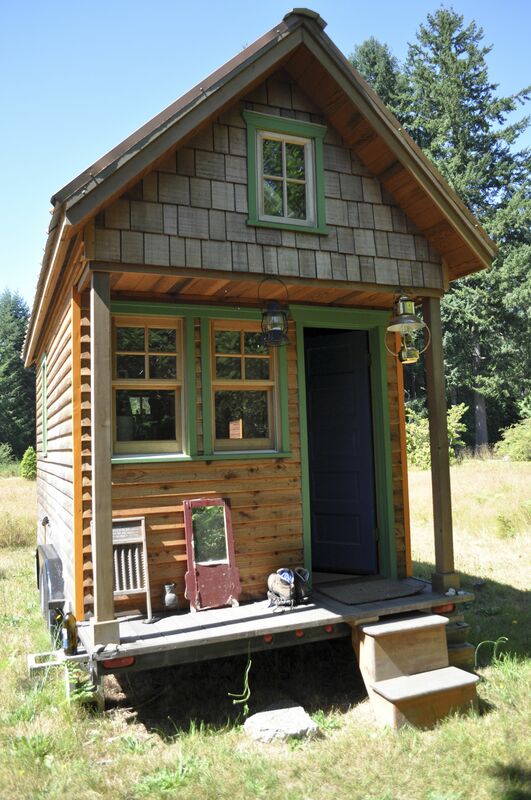 Part of the appeal of tiny homes is their portability. 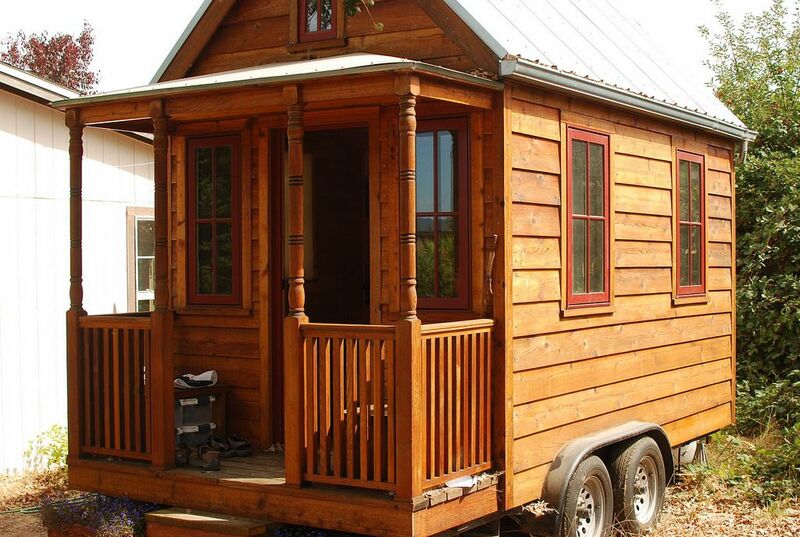 Many homeowners who chose to live in a small house enjoy traveling and can simply tow their house to whichever location they desire. Living in a movable home is especially useful during a disastrous storm. Tiny homeowners don’t have to worry about the tree next door falling on their home or car. They can simply tow their house to a safer location away from trees or beside buildings which may break the wind. The smaller an object is, the less force is required to lift and throw it. Unfortunately, the same principle is true of tiny homes. From the outdoors, homeowners can anchor their tiny homes to the ground with straps, bolts or other tie-downs. While some choose to anchor their home to trees for ease and stability, the danger of falling foliage may entice others to shackle their home to the ground with adjustable anchors. Those who live the tiny lifestyle should seal their home as tightly as possible to prevent wind from rushing inside and providing lift. The goal is to keep your tiny home as aerodynamically designed as possible. Features that could provide any form of resistance or lift may prove dangerous during a hurricane or tornado. If your home has solar panels, ensure they’re removable. Install hurricane shutters to protect your windows from debris and seal any holes from nails, screws or drills that may remain in your walls. Any cracks or holes could allow water to penetrate the home. If your home has additional outer buildings such as an outhouse or shower, ensure they’re equally prepared and secured for the storms. No matter what materials were used for your home’s siding or roofing, keep them well-sealed all year long to prevent sudden major storms from destroying your house or causing water damage. If your home is made of wood or has wooden siding, sealing is especially important, as wood can absorb moisture and rot. When a major storm is brewing, tiny homeowners need to be especially proactive to protect their investments. However, these convenient little abodes are more than worth the effort. If your tiny home has suffered damage from a storm or if you’d like to consider installing removable solar panels for future energy efficiency and storm preparedness, Aspenmark Roofing & Solar has you covered. No matter the size of your house, your roof is one of the most vital components of a secure home. With more than ten years of experience repairing and installing roofing and solar systems, our roofing and solar experts will ensure you have the resources you need to rebuild and recover after a terrible storm. Contact us online or call 214-823-7663 to request a free quote today!